This chapter discusses how the African Commission and African Court on Human and Peoples’ Rights have interpreted state obligations under the African Charter, particularly the due diligence obligation to investigate, prosecute and punish human rights violations. The chapter considers the case law from the last 10 years of both the Commission and the Court. The authors find that while both bodies can, at times, be directive and detailed in how they want the States Parties’ obligations to be interpreted under the Charter, a consistent approach is yet to be developed. The chapter also looks at the approach taken by the African Commission and the African Court in assessing human rights violations under international treaties other than the Charter. 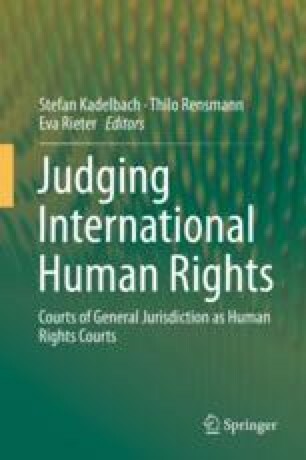 The authors find that while both bodies tend to consider legal instruments other than the Charter in their assessments of the merits of human rights claims, their practice in finding violations under other instruments is yet to be developed consistently. The references have been updated as of submission of the manuscript, in January 2017.